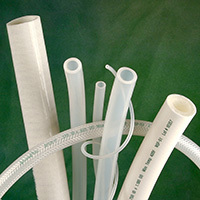 Low volatile grade, platinum-cured silicone hose is clean room produced for critical pharmaceutical, biopharm, cosmetic, and food applications. Polyester yarn braiding inside the wall enhances the pressure capabilities. AdvantaSil® APSH has undergone extensive physical, chemical, and biological testing and meets USP Class VI, FDA CFR 177.2600, ISO 10993 and European Pharmacopoeia 3.1.9 standards. Full BPOG standardized extractables test protocol has been performed on the hose liner by a fully-accredited, third-party test lab.